Tottenham star reveals why he left Arsenal | The Transfer Tavern | Where football transfer rumours fly or die! 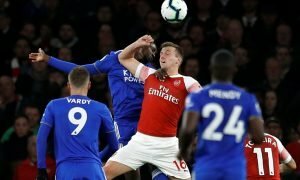 Tottenham Hotspur fans in the transfer tavern will be choking on their pints as it has been revealed that beloved striker Harry Kane was once of bitter rivals Arsenal. Many were already aware of Kane’s apparent allegiance to the Gunners when a photo emerged of him in a Arsenal at a tender age. However it has now been revealed that Kane who scored 31 goals for Spurs last season was in fact on books at the North-London club for two years. However before Spurs fans in the Transfer Tavern drop their peanuts in disgust Kane was released at the age of nine before been picked up by Tottenham after a season at Ridgeway Rovers. So Tottenham fans, what do you think? Does Kane’s former past with the Gunners change your opinion of him? Comment below!